Why is my paycheck different? Let’s see if we have this correct: ever since the first of the year, your paychecks have been a little bit different. You didn’t receive a raise and nothing else has really changed with your job, but it’s just not the exact same as 2017. And, if we can really be forthcoming (we’re friends, right? ), you’ve noticed it’s a few dollars more than it used to be, but didn’t want to tell anyone in case it was a mistake and they came back looking for the money. Here’s what’s really going on: subsequent to the new tax laws that passed in December, the Internal Revenue Service also updated the Withholding Calculator. They have suggested, and we concur, that it is a wise idea for everyone to follow that secure link and perform a quick check of your withholding. It’s a very user friendly form and shouldn’t take more than 10 minutes to complete. Why should you check your withholding? The two most obvious answers are to make sure you don’t have too much or too little withholding. Too much withholding will result in you receiving a refund next year when taxes are due on April 15, 2019. While you might like the idea of a refund, also keep in mind your sweet Uncle Sam is holding your money all year. If that’s okay with you, it’s certainly okay with him! Too little withholding will result in a larger paycheck for you each time you get paid. However, it can also create an unexpected (and unwanted) tax bill on April 15th as well as potentially penalties from the IRS. Okay, so now you understand why your check might be different and how to run a checkup to see if your withholding is where it should be. If it is accurate, you’re all set and there’s no action required on your part. What do you do if it’s not the right amount? It’s as simple as requesting that your employer change your withholding. That can be done very easily by filling out a new W-4 form. Please notice – this form was revised for 2018. If you have a previous version, please be sure to update your records. https://kuberneocpa.com/wp-content/uploads/2018/03/why-is-my-paycheck-different.jpeg 527 1030 AETHER Marketing Communications https://kuberneocpa.com/wp-content/uploads/2017/04/kuberneo-cpa-accounting-firm-orlando-color.png AETHER Marketing Communications2018-03-27 11:58:542018-11-04 03:51:59Why is my paycheck different? How Can I Compare My Product to the Market? The market is saturated. It hardly matters anymore what industry you’re in, consumers have more choices for products and services than ever before. It used to be that once you got your product on the shelves the hard work was done. But while barriers of entry have gone down, consumer awareness is heightened. Even shopping for school supplies takes a turn when a simple number 2 pencil can have 1600+ reviews! To survive in such cutthroat competition your product or service must meet market demands and the best way to know it will is through product comparisons. The need of product comparison to the market is an ongoing process and should be done quickly and regularly. Gone are the days when you only had to study the market while choosing the business sector and launching the product. To keep up with the pace, you must keep an eye on the market day and night—one missed opportunity can hit your accounts hard! Each product and service is designed to cater to a particular segment of people. It is suicidal if you don’t understand YOUR target customers and their demographics. If you’re not aware of what portion of the population your product will sell to, then it will be difficult to succeed. You cannot use trial and error just hoping to stumble on the right answer and survive in the market. The market will always be stuffed with companies that sell the same product or service as yours. Knowing those companies is not a difficult task, but your focus should be to identify those companies which target the SAME customer base as yours. Always choose the right competitors otherwise it may mislead you. For example, Levis cannot consider Armani or Gucci as their competitors as they both target different segments and there is no space for comparison. Create a competitive market analysis. Visit competitor stores and look at their product ranges, prices, specifications and so on. Check their online presence and gain knowledge that way. Hit up social media, forums, etc. to discover the buzz around your competitors. It is important to be impartial while conducting this study and see each competitor through the customer’s view. This way you will have a true idea of the positive and negative points of your product and you will be able to make your product more competitive. Analyze the transactional and historical sales data of your product or service. This data speaks a lot about how your product is performing in the market. You can also do a region-wide analysis to know the trend and potential growth areas. Conduct a study of consumer behavior. This can be conducted through small surveys—a quick set questions when they are purchasing your product or may be an online feedback form. The most important thing to remember is to formulate appropriate questions—they should be brief and should provide you insight into the consumer behavior. These key areas of analysis will help you formulate a strong comparison of your product to the market. However like most data it’s only really useful if you put it to work. Make sure you get the most out of your efforts by tailoring your product or service to what the market really wants. Then repeat the process regularly to keep your business in top shape! What’s the best lesson you learned from comparing your product or service to the market? If you’ve never done a product comparison what would you like to learn? Let us know in the comments below! https://kuberneocpa.com/wp-content/uploads/2018/03/product-to-market.jpg 686 1030 AETHER Marketing Communications https://kuberneocpa.com/wp-content/uploads/2017/04/kuberneo-cpa-accounting-firm-orlando-color.png AETHER Marketing Communications2018-03-08 04:35:012018-11-04 03:53:16How Can I Compare My Product to the Market? We expect you’ve heard by now there’s a new tax law that went into effect on January 1, 2018. The law is commonly known as H.R. 1 Tax Cuts and Jobs Act of 2017. If you’d like to read it in its entirety (or are having issues with insomnia), it is available at https://www.congress.gov/bill/115th-congress/house-bill/1. As of the date of this writing, the IRS has not published specific guidance on this part of the new law. We, and many other experts, interpret the law to indicate that no changes were made to the rule allowing a 50 percent deduction for business meals. Likewise, no changes have been made to the 100 percent deduction for expenses incurred for recreational, social, or similar activities primarily for the benefit of employees (other than employees who are highly compensated employees). HOWEVER, some experts are of the opinion that meals purchased while hosting a customer or prospective customer are no longer deductible. What does all that mean? What do we recommend? Keep copies of all receipts related to meals purchased for business purposes and make notes related to who was present at the meal and the topics discussed. This is best practice for ALL business receipts. Keep detailed notes regarding the purpose. Lest you think the 2018 tax law contains only bad news, there are highlights. The standard mileage rate, for instance, has been increased. Business use of a van, pickup track, panel truck, or car is now 54.5 cents per mile as opposed to the 53.5 cents per mile that was allowed in 2017. When they say “every penny counts,” this is when! Be sure you are documenting your business mileage as well as tracking your expenses. Every 19 miles driven for business is over a $10 deduction. As we get ready to celebrate the Holiday Season, many business owners, particularly in South and Central Florida, are still recovering from Hurricane Irma—one of the strongest hurricanes to hit the United States since Hurricane Andrew. Hurricanes cause anxiety to both homeowners and business owners before a storm hits, particularly as a result of last-minute preparations, storm-related expenses, evacuations, and the anticipation of potential damage and casualty loss to residences and commercial property. However, a more pervasive reason for distress is the aftermath of landfall. Hurricane Irma made landfall on September 10, 2017 and this unusual weather event interrupted the lives of millions of Florida residents who either evacuated or hunkered down before coming ashore. Businesses suffered widespread losses as a result of Hurricane Irma and its damaging path. A total of 48 out of Florida’s 67 counties were affected by the storm, resulting in more than $25 billion in losses—according to the Florida Office of Insurance Regulation (OIR). On September 29, 2017, the President signed the Disaster Tax Relief and Airport and Airway Extension Act of 2017, which effectively provides tax relief to individuals and businesses impacted by not just Hurricane Irma, but also Hurricane Harvey in Texas and Hurricane Maria, which massively affected the U.S. Commonwealth of Puerto Rico. The following are items that Kuberneo CPA feels are applicable to our clients, friends, and family who were located in Disaster Areas affected by all three major hurricanes of 2017. If you meet the criteria of this new tax relief extension, you could qualify for substantial tax relief. Eliminating the current requirement that uncompensated personal casualty losses that exceed 10 percent of adjusted gross income to qualify for deduction and eliminated the current requirement that taxpayers itemize deductions to access this tax relief. Providing an exception to the 10-percent early retirement plan withdrawal penalty for qualified hurricane relief distributions. Temporarily suspending limitations on charitable contribution deductions associated with qualified hurricane relief made before December 31, 2017. Providing a tax credit for 40 percent of wages (up to $6,000 per employee), or a $2,400 Tax Credit per employee, if you own a business and have employees affected by hurricane-related business interruption. Allowing taxpayers to use earned income from 2016 to determine the Earned Income Tax Credit and Child Tax Credit for the 2017 tax year. The above new laws are only a small portion of the New Disaster Tax Act provisions. There may be additional benefits or advantages that only a tax professional can identify through a private consultation. A beneficial outcome can be a welcomed opportunity to offset the losses and remunerate your business—and the accounting staff at Kuberneo CPA is ready to help you evaluate your unique situation. The only way to find out is by allowing us to calculate losses and weigh them against the New Tax Act provisions for hurricane relief—which can result in substantial tax savings for 2017 tax filing year. Ready to find out if your business qualifies for Hurricane Irma tax relief? Send us a message today or call our office at (407) 582-0703 to schedule a private consultation with one of our Accountants. This worksheet is to help your employer know how much to withhold from your paycheck. The top part of page one, as well as page two, are for your use only. These parts are to help you figure out how many allowances you are entitled to take. Page two gets into more specifics for example, if you and your spouse both work, you’re single and work more than one job, or if you plan to itemize. The more allowances you claim, the less income tax will be withheld from your paycheck- aka mo’ money. However, this mean, yes you get more money in your paycheck and less tax taken out in that moment, but in the future this could mean you’ll owe the IRS mo’ money, which could translate to mo’ problems…depending on how you feel about making a payment to the IRS. The alternative to this is you claim less allowances, so taking more tax from your paycheck up front, meaning in the short term your paycheck will be a little less, but come April, you are more likely to get a refund from the IRS than owe them money. You can also choose to have additional money withheld from each paycheck if you’d rather pay the IRS upfront and not chance owning come April (this is where a conversation with your CPA could be helpful…have them do an estimate to ensure you’re withholding the correct amount). Bottom line- The total number of allowances you claim impacts the size of your paycheck and whether you will get a refund or owe money come April. The key to this, as in anything in life really, is finding balance and what works for you. Would you rather have a little less in your paycheck now and not owe much or maybe even anything in April? Or do you prefer to have more of your money now and plan on paying later? As always, if you’re unsure about how something may affect you financially, you should reach out to your friendly CPA to have the conversation about what may be best for your given situation. In the time I’ve spent working for an accounting firm, there’s a regular occurrence that happens around here. A client calls to tell us about a big decision he’s just made but is running into some snags. Let’s call this client Harold. Harold has gone off and made a big purchase, without talking to his CPA first. Now of course Harold has every right to do that, but this time it’s lead him down a path of it having some not so great tax implications. If only dear ole’ Harold had reached out to his CPA BEFORE, he may have had a different story. It’s because of clients like good ole’ Harold that Dan Myers wanted to start a company like Kuberneo CPA in the first place. I remember him telling me pretty early on that in the past he just did clients’ tax returns and would see places where he could have helped if only he’d had the chance the previous year, but alas, here he was doing the return so it’s too late. Dan wanted to get into a position of being able to offer strategy to his clients to help make smart tax moves…thus Kuberneo CPA was born. Never fear future Harolds, I have made a BEFORE list for you. In addition to asking your financial planner, it’s a good idea to meet up with your CPA BEFORE making moves in a lot of these areas. Just taking the time to have the conversation could save you a lot of money, effort and heartache. Hey Harold, you still with me? It’s not that your CPA will tell you “no” regarding a big decision, but they can offer critical information for the decision making process and may be able to offer strategies or alternate options that can help you achieve your goals while minimizing taxes. One more quick note- in general, it’s a good idea to set up a meeting with your CPA sometime between October-December if you haven’t been checking in with them throughout the year. This allows time to implement tax saving strategies, before the end of the year. About 14 or so years ago, an enthusiastic 12th grade student walked into her small hometown bank in rural Michigan to open her first checking account. Can you feel the excitement?! Well for me, there was A LOT of excitement actually! I was preparing to leave my little town behind for the slightly bigger town I’d be attending college in that fall and needed an ATM/debit card. Up till this point in life I had a savings account and cash stored in the very secret location of… the top of my closet. The bank signed me up and besides a lollipop (Where do they even get these? Is there a special candy for banks store? ), they also sent me home with a checkbook for my new account. I had watched my mother write in her checkbook my whole life and I had also taken a class in middle school that taught us how to balance a checkbook (A skill I was surprised to find out most of my peers never had been taught really), so thankfully, with a little refresher, I was ready to go. Responsible Checking Account Owner (or RCAO…ooh that’s catching! ), here I come! While RCAO hit a snag here or there with keeping up with her checkbook, the world of internet bank really gave her a leg up. I could check my bank balance anywhere, anytime…so much so that most of my peers didn’t even use checkbooks anymore (So much so that some jerkfaces might make fun of one RCAO for using her checkbook still…it’s fine, it’s fine). With accessibility on my side, referencing my checkbook against my monthly bank statements became easier than ever. It wasn’t until I came to work for Kuberneo CPA that I found out this action even had a name (besides, “Oh crap how much money is actually in my bank account?”)…Reconciliation. One last tip if you’re getting started: It wasn’t till the last six months that I have transitioned away from using a physical checkbook and now have an app I use on my phone, but I still reconcile my account with my statements every month. (Only now it’s even more likely to be accurate because it does the math for me!) RCAO over and out. If you own a business, are looking to start one or just love new idea’s, Shark Tank is probably your favorite show. Almost every other night when my wife and I are able to, we’ll sit in front of our TV and just debate one sided with or against the sharks. The show is a perfect reality for anyone wanting to grow and expand their business. I’d like to invite you into a unique business opportunity that I fully believe will change the rest of your life, for the good. I’ve surveyed tens of Americans from all over this country and found something worth investing both your time and money in. I live in Orlando, with my company based primarily online and I am looking to expand my business beyond my home into stores, that I know the American people and even global citizens will find beneficial. I’m asking: $600,000 for 10% stake in my company. Now that I’ve left you on the edge of your seats, I’d like to present: Lemon flavored water. Well, I don’t have a crystal ball, but I can predict it’s going to be hard to convince a room full of sharks that lemon flavored water a 6 million dollar business – even with headquarters in Orlando in the summer! Just like in the show, the reality of expanding your business is that you’re going to run into snags. Nothing is going to work without being excessively honest with yourself. That is the only way you’ll KNOW to GROW. Have you done a SWOT (Strengths, Weaknesses, Opportunities, Threats) analysis? Have you gone out, doing field work for your product to get opinions? If you answered no to any of the questions listed above, reassess yourself for a moment. You have to stop yourself from saying, “Oh, we’re growing too (fast/much/popular), we don’t have time for any of this!” These are barebone questions that are designed to help you expand your business. If you ignore these questions, you’re going to experience a very brief success. Every person that starts a business would love for their business to successfully expand; a lot of us want our company to be the next Apple, Google, McDonald’s, or Starbucks. If you aren’t going to go back to your roots when you started your company, growing successfully will become a huge problem. Although growth to some is a huge success, to MOST, growth will be a huge disaster. If you notice, a lot of things on the list above are personal problems. If we know nothing operates willingly, then we need to be honest with ourselves. The key to business expansion is learning. Learn from your mistakes, learn from your customers, learn from your competition, just be open to being intentional to learn things you didn’t know before. The truth is that you don’t know what you don’t know. So learn! A P&L Statement is a whole lot easier to explain and understand than you might think. Luckily for me, my mouth is big enough for both my feet to fit in. I’m not proud of that conversation, but hey, hindsight is 20/20 and I have an up-to-date prescription because of it that I will be more than happy to explain to anyone who needs to know. For the sake of discussion let’s say that you have two kids, both of them come up to you and say, “Parent of mine, it’s the first of the year, we’re feeling ambitious and us as siblings want to open up a lemonade stand so that we can make some money for ourselves.” You being the loving and kind parent that you are understand that you’ll be the person providing the property and finances for them to start their new business that they’ve decided to call “Lively Lemonade, LLC” (You have some smart kids, that’s a name I would have thought was clever). You take this information and you make a deal with them. Saying that you’ll make them a list of rules that they have to follow to the T.
They have to keep track of the amount they make on a daily basis (Total Revenue). They have to keep track of how much they spend on lemons, sugar, cups and the occasional bottled water to sell to any passerby runners (Costs of Goods Sold). They must stay on top of how much waste they have at the end of each day (Depreciation). You can’t forget about the pitcher, the stirrer, the sign, the paint to paint the sign and the chairs to sit and relax on when business is slow (Utilities). Since they’re using your front yard as a point of sale, it would be ludicrous not to charge them monthly rent (luckily for you in this story you live in a wealthy neighborhood). Your kids are charging $.75 a pop. You put together $2.00 a month just in case there’s a slow month here or there. If they follow this list of rules you’ll loan them $10.00 apiece. Being that it’s a loan, they have to pay you back. Your kids have put forth an A effort, they have the looks of true hard workers on their face (the look of defeat and accomplishment all at the same time). They come to you with a problem, they want to grow their business and bring on their friend Sam, who lives down the road as an equal partner, but they aren’t sure if it would be worth it, financially, to bring on Sam. Thank goodness you had them keep track of everything you had them keep track of, because now, they get to draw out the super, awesome, rocking, cool graph we have listed above. The Lively Lemonade, LLC has a Total Revenue of $250.00 with a Gross profit of $220.00. The gross profit is calculated by subtracting the Costs of Goods Sold which is of course $30.00, from the total revenue. The Operating Expense of ($79.00)= rent ($24.00) + utilities ($15.00) + loan ($20.00) + depreciation ($20.00). The net Income is $141.00 = Gross profit – Operating Expense. We come to the dreary total of $141.00 made over the course of the year. They have to split right down the middle between the 2 of them to a whopping $70.50. That’s a grand total of $0.06 an hour for 4 hours a day, 5 days a week, for 52 weeks. As a kind parent looking at your kids P&L statement, unless they’ll be opening up a second location in another neighborhood, you should probably advise against adding Sam to their business, but I’m not going to tell you how to parent your imaginary kids. 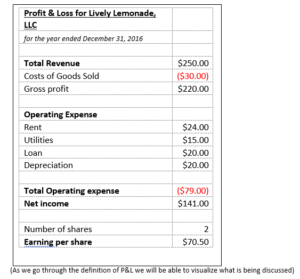 As you move forward in your business for this 2017 year, utilize the P&L Statement as a compass to navigate to a direction of financial growth. all the employees were settling down, enjoying the holiday stillness. knowing good and well that tax season soon will be here. you spring from your desk to see what was the matter. it’s finally happened, your computers have crashed. You’d planned everything out and now your office expenses just rose. it’s too late in the year for any more tax planning. Is this your Christmas tale? Don’t worry, it’s not too late for you! In fact, it’s never too late to do tax planning for your current tax year. As this year comes to a close, consider some opportunities your business may have when it comes to deductions and write offs (depending on the tax structure of your business of course.) Like the story above, perhaps you know that you need to purchase 3 new computers sometime soon, why not purchase the computers before the end of the year to receive the write off for this tax year (assuming you meet certain requirements)? Take an honest look at this tax year, and ask yourself, would it be better to purchase these assets this tax year or next tax year. If you’re a small business and will have made $10,000 this year and are projecting to make $100,000 next year, the deduction will be more beneficial for you next year. What is your business income for this year? What are you projecting it to look like next year? Are you considering prepaying certain expenses? When will your assets add value? When tax planning, remember to remain calm; you’re not alone in feeling like this is a scary thing. This is the season for joy and peace on earth (regardless how cutthroat Black Friday was) and let that soothe you… then set up a consultation with us to help you finish this tax year strong.